10) Anton van Leeuwenhoek's Paper on Organisms Discovered through Microscopic Observation. The notion that organisms wriggle around below the scale of our sight is preposterous; nevertheless, any work that stokes the Society into such confusion has done some good in the world. 9) Tea. Our city still loves coffee, but tea has gained standing among Learned Londoners. I promote its consumption in place of coffee whenever possible, as it does not excite the yellow bile nearly so forcefully as coffee. For those already choleric -- Jack is a prime example -- this substitution will likely add a decade to their life. "Why, first, I could never keep a secret in my life, and then there is no charm so infallibly makes me fall in love with a woman as my knowing a friend loves her. I deal honestly with you." Fathers, well would you do to keep your daughters close by your side! 7) Bacon's Rebellion. I usually take up arms alongside those who take matters into their own hands, especially when they do so against those damned Toads of Tidewater. Poor Nathaniel Bacon's rule of Virginia was a great, inspired pleasure, if short and ignomiously ended. The Observatory's contributions to astronomy (not to mention architecture) cannot be underestimated. I eagerly await its findings. 5) The Close of the Tenth Year since the Great Fire. London has since acquitted itself well in its reconstruction, though a more rigorous program to expel Catholics would be preferred. 4) The Ruffle Returns. I had always insisted that the cravat was a mere passing fancy, and that a proper, respectable collar with full ruffles, of the sort you see me wearing to such great effect atop this post, would again be the Fashion of Choice for respectable men; this despite Jack's views to the contrary. Near oblivion just a few years ago, in 1676 the collar has made such inroads against that ridiculous napkin calling itself a "cravat" that I forsee the latter being made extinct by the end of the decade. 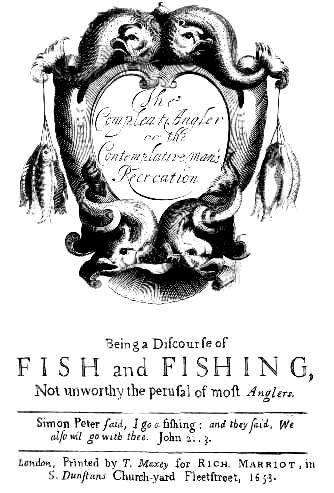 3) The Compleat Angler, Fifth Edition. No book has brought me more pleasure on an idle afternoon than Izaak Walton's literary stroll through his favorite pass-time; when reading it I almost wish to spend time outdoors. I worried that any further revision would destroy the book's charm, but this edition's seven new chapters are the rare successful instance of making still better something that needed no fixing in the first place. 2) The Crimson Unicorn. For the first time since returning to London, a new Public House has surpassed the Griffin in my esteem. I base my assessment on the superior quality of their port; the exceedingly pleasant form of their whores, and their smart tongues; and the House's willingness to extend Jack credit beyond all reasonable limits. Special recognition is due here to Sean, who first took us to the place, and to Odyllia, who introduced me to all of its aforementioned virtues. 1) Peep This Diary, and you. Thank you, gentle reader, for giving me good cause to post each and every week. I look forward to the same, and more, in the coming of the Good Year 1677. Out: Nathaniel Bacon. Dysentery, poor chap. In: Francis Bacon. I had always been content frying up a rasher or two with a liberal dose of butter, but Patrick tells me that the alchemists are all abuzz with talk of a new “Baconian method,” so I will cede to his judgment in this matter. Out: Pope Clement X. Like all popes, this one spoke a nasty foreign language and lived an unnaturally long time. Good riddance to him. In: Pope Innocent XI. Cut off a head and another one grows in its place. New face, same silly hat. Out: Catholic Terrorists. Attempting to blow up Parliament, burn down an entire city, and take control of the monarchy is all in a decade’s work for a dedicated papist, but some of us are beginning to tire of the whole business. In: Terrorizing Catholics. It will start, no doubt, with just being occasionally cruel to them, but I’m hoping for public hangings by the end of 1677. Out: Monogamy. A man who still holds it valuable to remain faithful to his wife may get himself to sleep at night by counting up the king’s mistresses, from Nell Gwynne to Lucy Walter. The rest of us have other ways to occupy ourselves at night. In: Nell Gwynne. If she’s good enough for the king, she’s good enough for any man in England. That seems to be her philosophy anyway. Out: George Etherege. Man of Mode was doubtless the comic highlight of the year, but I sense that the nation is growing weary with the Comedy of Manners. Indeed, with the way the Whigs are carrying on in Parliament, it seems that some of us are ready to abandon manners altogether. In: Aphra Behn. The notion of a woman writing plays is as humorous as anything even George Etherege could come up with. I expect we have not seen the last of this monstrosity. In: Peep This Diary. The blogosphere just isn’t big enough for the both of us. I post but briefly to give you a morsel of what is to come: in the final days of this waning year, and after much feasting, I will recount some of the very best points about the 1,676th year of the Lord. The position I find myself in is not entirely unfamiliar. I am sat down to compose an account for you of my doings this past week, and yet I find my memory as reluctant to perform its assigned task as my head is sore—which is a considerable amount. In fact, the more I think on it, the more there is a part of me that rebels outright at the prospect of vouchsafing an account of the last few days, as if my having knowledge of the events I have been involved in were somehow more terrible even than the fact of my involvement. But I will start with what I do know, and perhaps we can piece together the remainder. First, an accounting: I am minus one boot, a gold ring that I had been accustomed to wear lately, the hair of my left eyebrow (which appears to have been singed off), two matchlock muskets, and a pair of velvet breeches. I am plus a silver crucifix of uncertain value, a blood-stained hat that by the looks of it belonged to a sailor, a great bruise on my thigh and another on my cheek, £50 sterling (nearly enough to buy me a small cottage in the country), and a one-eyed hunting dog who will not leave off barking at me. I remember very well leaving the house a few days ago to meet with a Dutchman from the East India Company at The Griffin. I also remember accompanying him to his home for some drinks and a game of cards, during which I became quite irate and left either because I caught someone cheating or because someone caught me cheating. I am quite certain that I also attended some abysmal play in cheapside, but beyond that I can dredge up very little at all except a strong suspicion that I will not be welcome back in the Crimson Unicorn in the foreseeable future. I arrived home yesterday morning, and Patrick kindly helped me to my bed and brought me tea, after which I did not wake until just now, when this dog began barking at me. Well, we shall trust God that I have not done any lasting damage. The lasting damage to Sean's head is only internal, with the split in his brow well healed, and quickly. The man has the physical constitution of a boar. His soul is another matter. Since his attack, this brawler has used every excuse to stay in bed, waited on by Jack's manservant and, when she thinks no one else is about, his housemaid. This has not been hard for her. Two days past, now, Jack departed, bound for "the Griffin for a quick one" before a play that evening, and has not returned since. This is not the first such occasion, and he usually turns up safely after a greater or lesser while, and occasionally wealthier. I am privy to Wren's latest thinking, however, and -- remember on whose post you first read this -- when complete St. Paul's will have a much bigger dome. I do not think this the work of Sean's usual tormentor: he seems more inclined to kill rather than clomp, and he would have known, were he intending to rob Sean, that Sean entering the Griffin has far more coin on him than Sean coming out. But to Sean the falling crowns, rampaging barrels, and blows to the head are all the same, and I do not blame him for the harsh words he has muttered about our great City. In his short while here, London has not been kind to him. I have made, I think, something of an error in judgement today. It is generally Patrick's habit to retire to his bedroom shortly after sundown in order to busy himself with his research for the Royal Society, that the world might one day be enlightened as to the relative degree of slope exhibited by the foreheads of inhabitants of the Northern British Isles, versus that which is characteristic of Britain's more southerly citizens. I am proud to inform you that, having listened to Patrick expound on this point at some length and on numerous occasions, I am quite capable of detailing his exhaustive findings on this topic myself, but I would be loath to spoil the surprise for you. Patrick's paper is due to be published in the Year of Grace 1677, so you will have to wait, with bated breath, until then. In any event, the point is that with Patrick locked in his chambers more and more often these days, it falls to me to entertain the Irishman (Sean) in the evenings, and I have found him to be almost a tolerable companion, as he appreciates the value of keeping his damn mouth shut excepting when he is addressed, and he understands better than any man I have known that the question "ought we to have another?" is strictly a rhetorical one. But tonight I think I might have had one too many, as I found myself talking at some length about my suspicions that Patrick might somehow be personally involved in Sean's recent run of poor luck. When I noticed that Sean was unduly interested in this theory (as he began pressing me for any information I could give him), I endeavoured to talk of privies and whorehouses instead, but his uncharacteristic lack of interest in these topics – which are generally irresistible to him – led me to believe that I had done more damage than I intended. I hope that this does not rebound on poor Patrick.